So why is it so important to be “labeled” an artist and why do I make such a fuss about this. Very simple: it helps explain and describe the process you go through. I’ll be honest. This breaks my heart, and the first thing I want to tell them is not to give up. The second is that the information is usually right in front of them. Usually my students are just almost there, and with a just a little more effort they would have figured it out for themselves. Now, I’m not trying to talk myself out of a job, cause like fashion itself, sewing and the techniques are never finished. By that I mean you can never learn everything, cause there’s always some creative soul out there thinking up new ways to assemble, embellish and/or otherwise differentiate a garment from another that involves a new technique to be explored and learned. I think the perfect example of this was the Karl Lagerfeld raw-edged trim on the Chanel suits….this was fabric intentionally frayed in an orderly manner to embellish on the trim that became a huge rage – it was a new technique to learn and master. 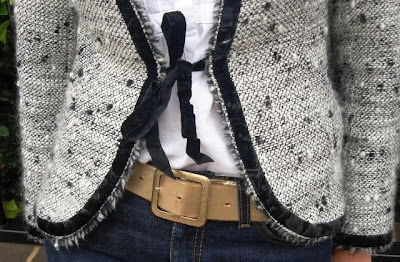 But in the basics, of assembly, especially when you are sewing for one size, style and shape, after you get the basics down, then you can play around with the embellishments and avantguard assembly techniques that fashion presents us with. What being an artist, helps you with most of all is the process. When you get an idea or inkling of something to do (you have a special event coming up or just missing a white blouse in your wardrobe), that’s the beginning of the creative process. Often this occurs with such subtlety that it’s hard to realize what’s going on, or it can occur with such excitement that it escapes our notice. You have just begun to bridge the gap between abstract and reality. No, this isn’t a schizoid moment, it’s the creative process – and although some would like to equate the two, they just don’t have a life and don’t get it!!! But think about this for a minute….you are taking some ethereal abstract thought and beginning to turn it into something that takes up space…that is physical. Energy = mass times the speed of light squared! From your thought to something that can be seen, touched and worn – it becomes something real. From an electrical synapse in the brain to mass. You’ve just become part of Einstein’s energy/mass equation, although fortunately we don’t have to work at the speed of light!!! Actually it’s no wonder that there are a myriad of puzzles to work out. And that there is nothing else like being more powerful than a locomotive, faster than a bullet and able to leap tall buildings in a single bound, more difficult to do. I say all this to hopefully make it easier for the creative process. To understand it and to accept that you are an artist, means that the very job description involves having puzzles to unwind and figure out. This doesn’t mean that everyday will have a myriad of Gordian Knots to untangle, because there’s also the business about practice. This is from the music department of art: Practice, practice, practice, then play. But visual artists and others do this as well. Pollock had to practice his abstraction style to finally come up with a style that was not only his own, but also a valid art style. Alexander McQueen had to study under the Savile Row tailors of London and then Maison Givenchy before he could go out on his own; and most of the famous designers of today have worked for major houses gaining the experience and practice to use later in their own houses of design. You did not pop out of your mother’s womb knowing all these techniques nor the expertise and experience to do them. Not only do you have to learn them, but you have to practice them. And although this takes a lot of time, it also takes the patience. But it helps to know that because you are an artist, this is normal. You will have moments of complete understanding and whip something up faster than a speeding bullet, and then there will be times when you are so confounded and confused that it will defy even the most brave and stalwart at heart. Don’t get discouraged, and particularly don’t quit. Often just a time away, sometimes very brief, can bring new thinking and a whole new way of looking at a puzzle. Most of all don’t think that you’re dumb or that you are dense and just can’t get it! That’s defeatist thinking and it doesn’t solve any problems. The whole advantage of thinking like an artist is to understand that you will inherently have problems and will solve them. Your solutions may be different and that’s part of the creative process. In the computer world, geeks are often fond of saying there are 15 ways to solve a problem, and it’s so true in life (only more than 15) and in sewing as well.